Facebook is world`s no 1 social networking website. Normally you check messages, news feeds and notifications on facebook. But if you do not want to use integrated facebook chat than you can use facebook web messenger available on Internet. best thing is that you don't get annoying notifications when you use facebook web messenger, so you ca concentrate on chatting. These web messengers are available online. You just need to provide access nd than you can start chatting. Here I discuss about 4 best Facebook web messenger that are available for free. 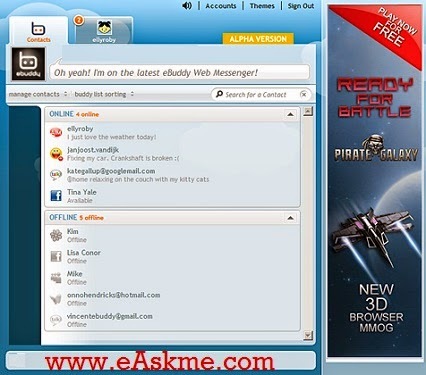 If you know chatting then most probably you also heard of eBuddy. This was one of the most popular and used messenger before facebook and whatsapp came into picture. This messenger allow you to enjoy custom background in chat box also you can add different accounts. This is also a famous web messenger. It allow you to connect many social network profiles and chat same time. Its interface is much better than FB messenger. You can save chat history and get notifications about new chat. Meebo is one of the simple looking Fb web messenger. Its easy and clean interface allow you to chat with multiple people same time. It also allow you to sign in too multiple networks. You can change font, color, emotiocons and themes. This is a good messenger but it has problem of getting disconnection. But it have much more features than other messengers. It is also ccompatible with all browsers. It offer tabbed chatting. These are the best facebook messengers that I have personally used. The first two are best and second two are just options. Try and share which work best for you. For more updates do subscribe eAskme feed.